Great final school event of the year, and rather local too, Bamber Bridge outside of Preston. It was my absolute pleasure to visit Brownedge St Mary's - staff at the school were already in touch with me through my social media activity and when the opportunity to speak to the students arose they really leapt upon it. I'm quite missionary with my visits to schools, passionately promoting the idea of wider reading for pleasure, but at St Mary's I really was preaching to the converted. It was wonderful to encounter staff and students alike who had a real love of literature - this can only help the pupils across all areas of the curriculum as they go forward through their school life and beyond. Big thanks to Tony Higginson's Formby Books for supplying books on the day, and certainly looking forward to revisiting St Mary's some time in the new year. 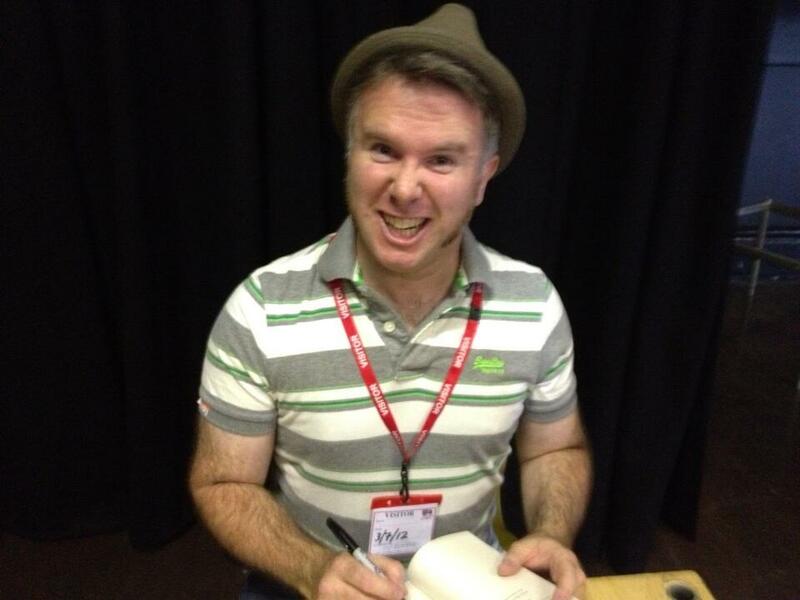 On that point, if any of you fancy having this wordling crayonboy visiting your school, please do get in touch. I've still got gaps in the calendar around World Book Day so give me a holler and let's make it happen. Have a very splendid holiday season and a happy new year! Who would like to host a Virtual Visit on my Wereworld Skype Tour? I know it's tricky for a UK based author like myself to visit classes in the United States, Australia, New Zealand and the like, so here's an exclusive learning opportunity for you, running for a week from the 2nd December. I'm offering 30 minute sessions where classes and groups of students can experience my acclaimed presentations. The talk has been a huge hit across the UK and also on my recent American tour, so if you fancy a whistlestop introduction to my career in animation (Bob The Builder, sorry!) which leads into me transforming him into a werewolf, then get in touch. I'll talk about the Wereworld series: the wider world of the Seven Realms of Lyssia, the Werelords who inhabit it, and where my inspiration comes from, culminating in a reading from one of the Wereworld novels. If the audience hasn't been shocked into silence, I'll be welcoming a Q&A at the end of the reading where students can pick my brains - just be sure to put them back as you found them. It'll be an interactive, inspiring, and thoroughly engaging virtual event which should get even the most reluctant reader excited about reading for pleasure! The only thing I ask in return is that the school ensure each of the students who participate (minimum audience number of 25, an average class size) has a copy of Rise of the Wolf, the first novel in the Wereworld series. The talk itself will be free. Teachers, librarians and parents: do please get in touch with your details. Students: tell your teachers and point them this way. Spaces on the tour for events WILL be limited, so get them while they're hot! Speed reading - don't do it! I've been getting an AWFUL lot of messages from folk via email and the official Wereworld Faceache page who have read War of the Werelords and are dismayed by certain deaths, one in particular. Firstly, I'd just like to say war is cruel, it's tough, it's heartless and people can and will die. Not everyone escapes unscathed. More importantly, though, can I ask you to please RE-READ the final chapter again, only this time, soak it up, take it easy, read carefully what is said. Either I've been too clever by half and far too subtle or there are a great many people who just speed-read these days. You miss so much when you skim - authors use all those words for a reason, you know? ;-) I don't want to get too preachy here (I do, actually), but so much of what characters think and feel is often hidden within the way they speak and think. It's the little things that can give away so much. As an example, I got a message from one reader the other day exclaiming they had received book six in the post. They'd been very excited about the prospect of receiving it as had been clear from their updates online. However, later that SAME DAY I saw an update saying they'd read it and loved it... IN ONE DAY??? I expressed my surprise and disbelief, to which they happily replied they prided themselves on being a 'quick reader'. No, that's nowt to be proud of. Skimming a book is just that: you're catching one in every twenty words, you're absorbing the merest details from a page as your eyes scan over it. You're not enjoying the book as the author had intended. It's like ordering a seven course meal and only taking two or three bites from each dish. To celebrate the UK release of the final book in the Wereworld series, I'll be embarking upon an official tour next week, starting on Friday 27th September at the Manx Lit Fest. After that it's a whistlestop tour visiting schools all over. If you're keen to pick up a signed, doodled in and dedicated copy of one (or all) of the six novels, I'd recommend you get in touch with one of the booksellers listed below. They'll be very happy to help and will reserve copies for you. Check the tour dates below, sniff out a bookshop and drop them a line! 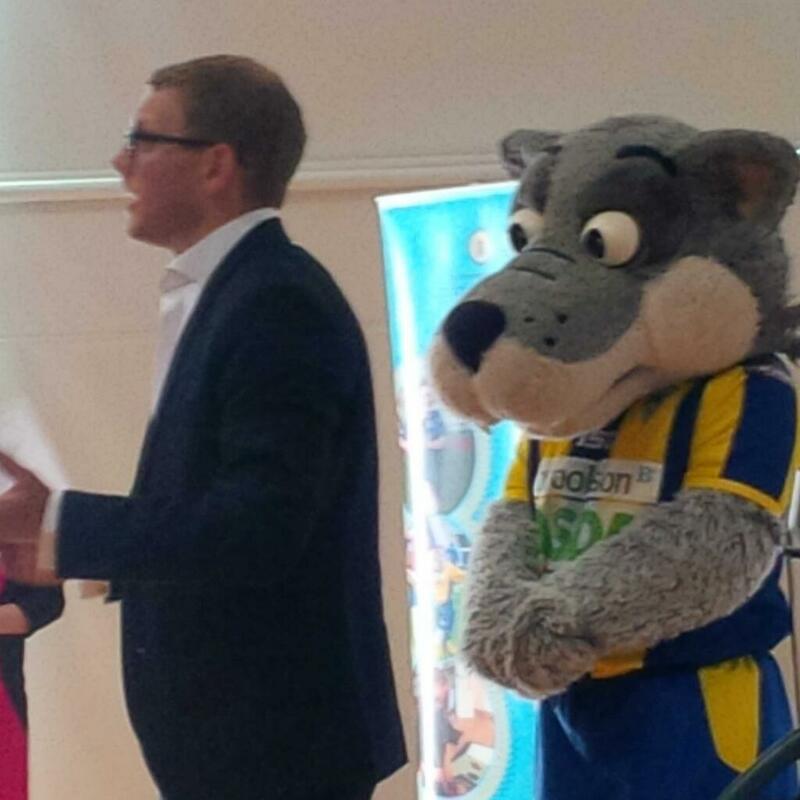 Warrington Wolves Foundation and the Children's University - Graduation Night! 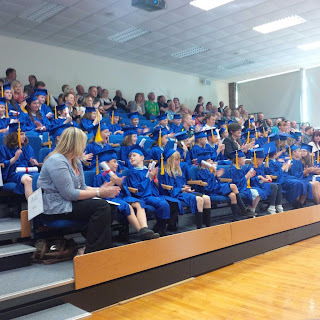 This evening I was witness to a pretty blooming marvellous spectacle, the graduation of 100 school children from Warrington through the Children's University scheme. 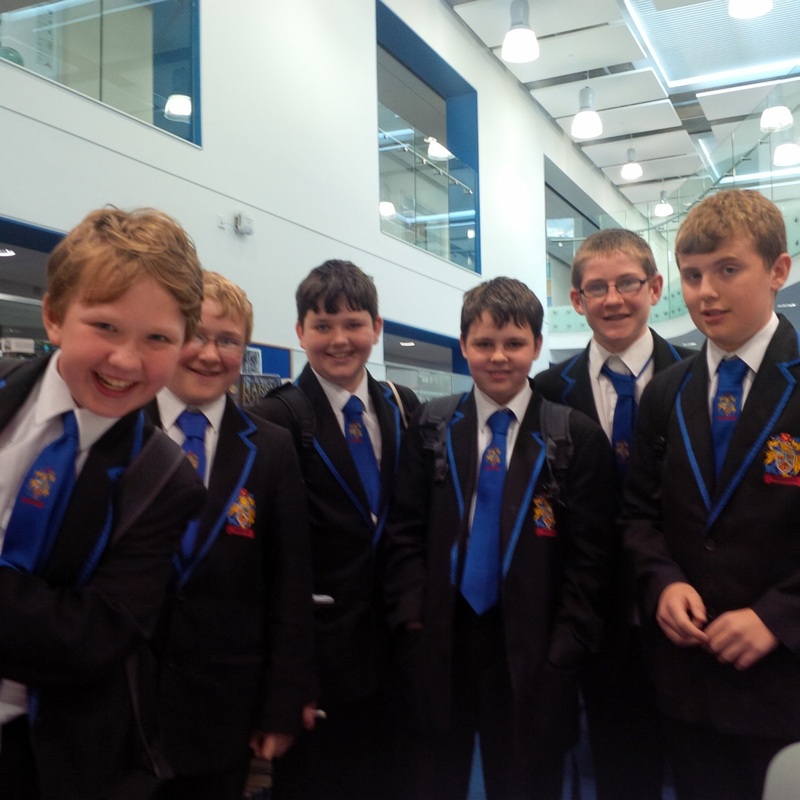 These were pupils who had participated in extra-curricular learning experience, outside of the classroom environment. The scheme isn't just in the UK, it's worldwide, and it's dedicated to providing educational activities to children of all ages alongside the fine work that schools provide. 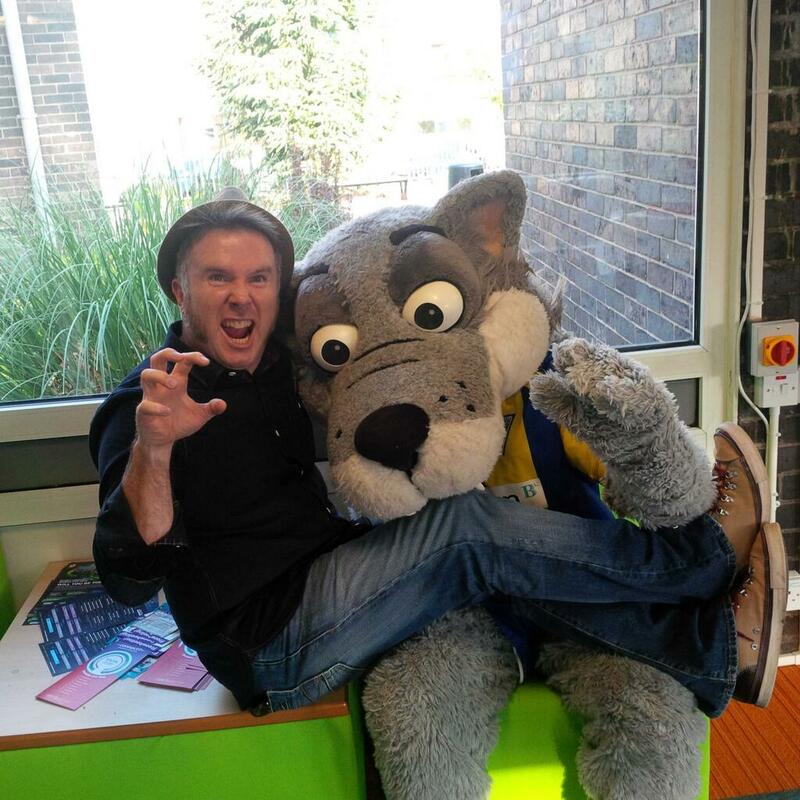 I'm patron of the Children's University in Warrington, through my work with the Warrington Wolves Charitable Foundation. Over the course of the last few years I've been delivering workshops to the youngsters of my hometown - as have many others - and tonight saw the children celebrate their achievements. Caps were donned, gowns were draped, and a procession of mini-graduates marched passed with grins of monstrous proportions plastering their faces. As if the smiles of the children wasn't enough to melt the coldest heart, the tearful looks on their proud parents and grandparents in the audience would've stopped a charging rhino dead in its tracks. No doubt some of those children in attendance, participating in the scheme, might not ever have considered a further education. Perhaps they will now. I don't know. Only I do know that if I'd had someone for creative industries (as an example) visit me in school when I was their age it would have had a profound effect. That's the biggest kick I get out of all my work: visiting schools all over the country and overseas and enthusing about the fact that one can make a living out of one's hobby. Writing WEREWORLD? A job? It's an absolute blooming pleasure, and I'm sure that came across to the kids tonight. I'm lucky that I've turned my pastimes into a career. That's what I've been doing for years. I might just get found out now. Huge thanks to Neil Kelly and the ace team from the Warrington Wolves Charitable Foundation for ALL their hard work managing the CU scheme in the town, and thanks to the University of Chester for the support they've shown. Wobbly handclaps to all those who've delivered workshops in the last year and all the parents who've encouraged their children to participate. Most of all, WHOPPING CONGRATULATIONS to all the boys and girls who have walked away from tonight's graduation ceremony with a very special certificate tucked under their arm. Here's hoping this is just the first step along a very special learning adventure! 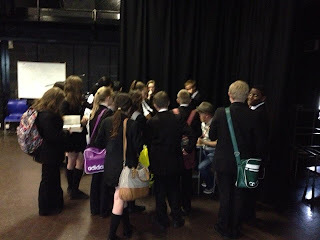 Author visit to Penketh High School, my old stomping ground! I spent yesterday at Penketh High School, scene of my formative teenage years and many bouts of bad haircuts, bogging acne and body odour. It occurred to me as I pulled up that it was 30 years ago since I'd first attended the school. More shocking was the fact that a handful of teachers who had taught me were still there (I'm mentioning no names to protect the innocent). I was speaking with Years 7 and 8 in the morning, 11-13 year olds, while after lunch I got to talk to the Year 6 pupils from Penketh's numerous feeder schools who were there for the day. As school visits go, this was a bit of a treat for me. If I'd had an author or artist visit me when I was there back in the day, it would've had a profound effect upon my fragile little mind. It would've shown me that one CAN make a living in creative industries, that art and media aren't simply bits of extra-curricular fluff. Sadly, I never got any advice as a lad that supported my desire to pursue a living in the arts. To now be back at my old high school and have the opportunity to enthuse about what I do for a living (which, let's face it, certainly beats a 'proper job') was a real honour. If what I had to say struck a chord with just one student who was in the room, then that's a job well done. If at the very least the lads and lasses were entertained by my wobbling gob then that also puts a big Cheshire Cat smile on my fat face. I also got to meet the rather marvellous Mr Hughes, headmaster of the school. You may better know him from his various appearances on morning television and viral tweets. I actually introduced him to Tony Higginson from Formby Books as 'Gangnam Head'. If you watch the video, all will make sense, I'm sure. Smashing chap. Massive thankingyous to ALL who were there yesterday, especially Ian Farrar for coordinating the whole enchilada, and Jon Kay for taking care of technical requirements (and providing good gossip) first thing in the morning. 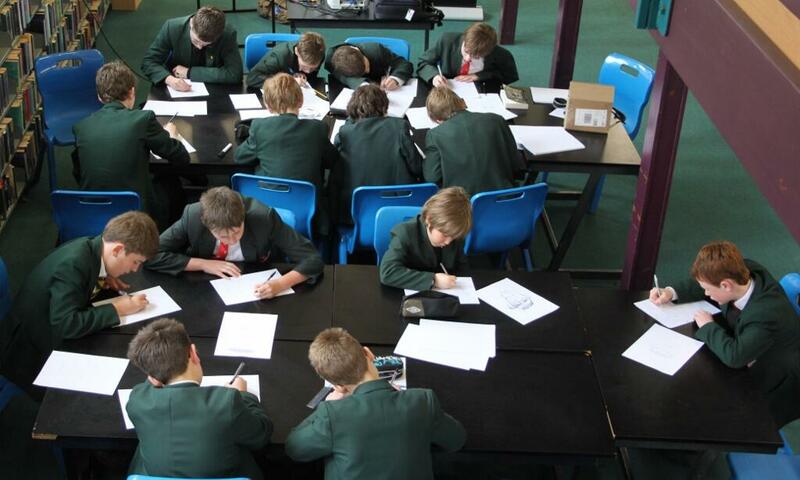 Most of all, thanks to all the students from Years 6 through 8 who endured my anecdotes, animations and arty doodles. You were great, every one of you, even the lad at the back who thought that Frostie The Snowman was a fair answer to the question: "Name me an entirely computer generated movie." I know. I don't know what he was thinking either. "Can I have your name please, sir?" That's what the lady at Starbucks asked yesterday. Naturally, I happily obliged, and this is what came back. That's not even an attempt at a real name. She may as well have just put a random collection of consonants together. I tried to make it easier on an earlier visit to a Starbucks, having had my name repeatedly misspelled by them. 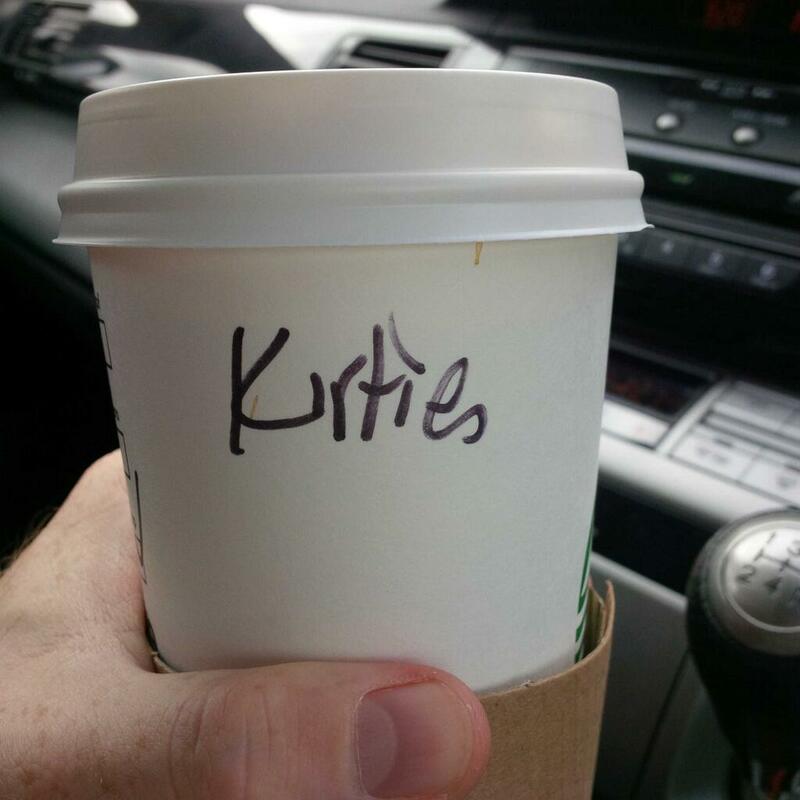 When they asked for my name I replied: "Spartacus", garnering a chorus of guffaws from others in the queue. Humourless 'barista' replied: "Can you spell that please?" 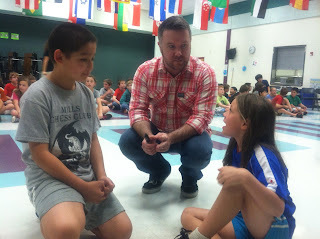 Hijinks with Tommy Donbavand, AWARD WINNING author of Scream Street! A grand day out in the company of the wonderful Tommy Donbavand today, author of the Scream Street series of books. 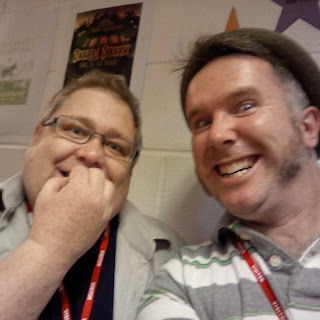 We were both appearing at St John Bosco Arts College in Liverpool for their annual book award ceremony, which Tommy's Scream Street was in the shortlist for. He was up against Michael Morpurgo, David Walliams and Jacqueline Wilson for the prizes, which in addition to the actual best book included best villain, best setting, best illustration and best character. It was a bit special to see the master at work. Tommy's a real pro. For Morpurgo he convinced the kids that the fellow hates children. This wasn't too difficult, all said and done. His other feats were far more impressive. Walliams was written off as a fraudster, his work the fevered wittering of eighty-six year old homeless man, Alfie Thompson (a surprisingly prolific author - just google what I've said!) And as for Wilson, the kids really bought into the idea that she punches kittens for giggles. After that all five awards were safely in the bag. Great to spend the day with Tommy and librarians Sophie and Claire. Cheers to everyone who came, hope you had a grand day. Bit of a special one for me tomorrow. I'm visiting Penketh High School, my old stomping ground, to speak to Year 7, Year 8 and the Year 6 pupils from all the feeder schools. Shall report in with a detailed report on my adventure tomorrow, but I'm REALLY looking forward to this one. QUESTION: What's the best thing you've ever won? For me it was winning my age group at the Liverpool Chess Congress when I was ten years old. I got to choose my prize - a Disney's Black Hole pop up book. Trust me, it was WAY better than it sounds, just like the film itself. So what about you??? A busy day today. 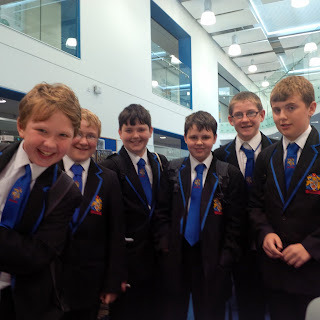 The morning was spent back at Wade Deacon High School in Widnes, alienating - sorry, working with - a bunch of Year 8 students. The gentle ribbing re: preschool characters being Warrington Wolves fans continued, culminating in one lad telling me he didn't like me one bit. This was directly as a result of Spud the Scarecrow's rugby allegiance, although the lad did concede that Wereworld sounded rather awesome. So I'm going to put that in the "win" box. 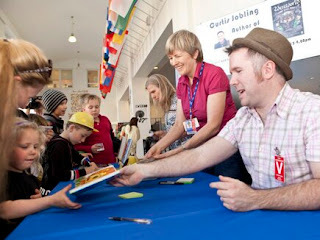 Signing session in the library brought a gaggle of yoofs who were big readers along, including young Ben, pictured to the left in this picture. Ben's what we call 'a character'. By that, I mean he speaks in an American accent. Yet he lives in Widnes. I asked what had made him move to Widnes, and he explained he's always lived in Widnes. It transpires Ben watches a LOT of US telly and has adopted the accent. A cautionary tale for all, methinks. Those old duffers out there might remember Dexter Fletcher in Press Gang. That's what I'm talking about. I still had time at the end of the day to make it to Daughter #1's school sports day, where I triumphed in glorious fashion in the Dads Obstacle Race. There was a touch of the flamboyant about my performance, naturally, with a bit more wiggling, skipping and victory celebrations than was the norm. But I felt I'd earned it. How to turn a roomful of peaceful pupils into a partisan mob with a rugby related anecdote. Come on, we've all done it, haven't we? Great day with staff and students of Wade Deacon High School in Widnes, Cheshire. This has been the first of three visits I'll be doing over the coming weeks, speaking to students in Years 7, 8 and 9. 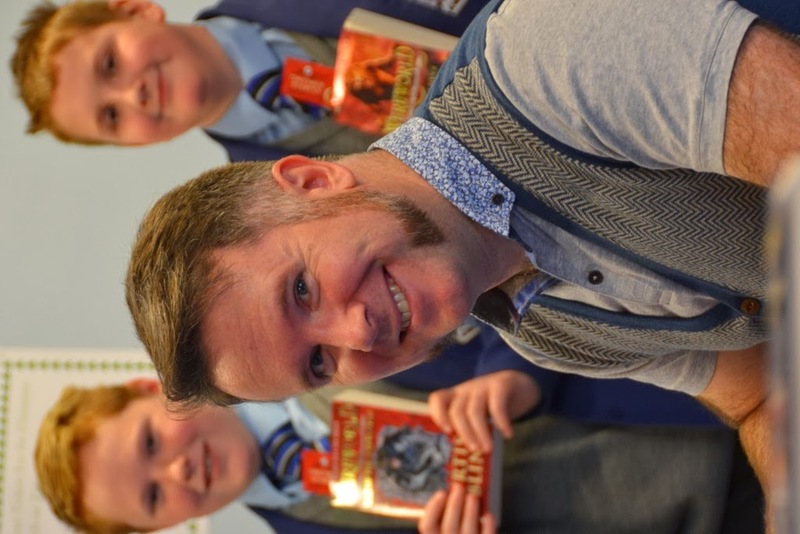 Showing incredible kindness and generosity, the school have chosen to purchase around 150 copies of "Rise Of The Wolf" for select pupils in each year group, a tremendous gesture. It was a huge thrill to see students walking around today with their books clutched to their chests, my graffiti daubed within the covers. Tomorrow sees me heading down to That London to meet up with my old mucker Tom McLaughlin. Tom's a super talented author/illustrator (you'll have seen his fab books) and the two of us have collaborated on our first 'lift-the-flap' picture book for Egmont Press. I haven't illustrated this - odd, considering my past in picture books - but simply written it. Fab artwork all supplied by Tom. On my OWN doodle front I'll be doing a new set of black and white pen and ink illustrations for the chapterheads in the UK edition of "War Of The Werelords". Kicking off with those on Thursday and I'll be previewing them on here too ;-) Stay tuned, Wereworld fans! Two (not so) random acts of kindness. Humans can be rather awesome, you know? one year old sister (she's a huge fan apparently), passing up his opportunity of getting a signed, doodled in edition of Wereworld. To say I find his kindness touching doesn't come close. Now, this young man is utterly unaware of the fact that his father has emailed us to let us know about this big brother's act of kindness for his little sibling. Dad's asked if there's any way we can send him a book, and he'll pay for it, as the poor boy is obviously a bit crestfallen. Even better than that, I suspect a certain author will be revisiting the school in the morning with a signed, doodled in copy of Rise Of The Wolf for the boy, and we won't be expecting pennies for it either. also received an email from a stranger in Yorkshire. I know what you're thinking: "That doesn't narrow it down, it's Yorkshire, surely they're ALL strange there," but bear with me. (Sorry, the cheeky Lancastrian in me just came to the fore). 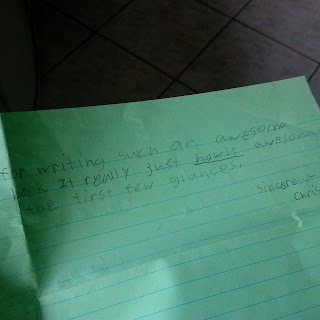 This was from someone who was living in our old house and had received fan mail from somebody in the United States. The stranger didn't know who I was from Adam, nor what my work was, but was so touched by the letter that they felt obliged to forward it on to us. We assumed they had received the letter at my old home which we left 6 years ago, a converted church reading room, in a North Yorkshire village, and said so much in our reply. Turned out it wasn't THAT home but the one we'd vacated 5 YEARS PREVIOUS to that. So, this lovely lad from the US had found an address that I hadn't lived at for 11 years. And somehow, the message still came through. Kudos to the tenant of my old house from yesteryear! Makes my helping an old woman up some steps with a shopping trolley this morning look rather paltry. PS: I'm allowed to make the Yorkshire joke - I'm a half-breed Yorkie mongrel thanks to my old man, plus I do rather love the old county. 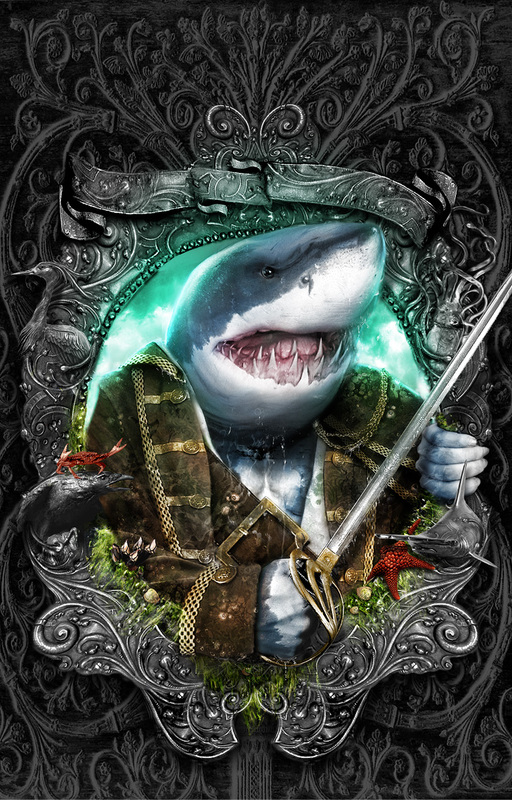 Today sees the US release of WEREWORLD: Storm of Sharks - long awaited and the penultimate volume in the series. Still working on the last book as we draw dangerously close to the deadline date, but rest assured War of the Werelords will be in stores in October. You can also take a look at the cracking video piece produced from yesterday's visit to Sandbach School. I had a fabulous time there (as you can probably tell) and am very much looking forward to a repeat visit. Huge thanks to librarians Ms Abrahams and Ms Tomlinson for arranging a great day. I had a great time this week on a rare visit to Bristol with the fine folk of Puffin. I visited two schools - Queen Elizabeth High and Bristol Grammar - encountering a super bunch of students and teachers. It was lovely to be back there as my own career really started in Bristol nearly twenty years ago, with a work experience placement at Aardman Animation Studio working on Wallace & Gromit's "A Close Shave". This made my talk particularly relevant to the guys and gals in the audience I expect. There's a lovely write-up of the BGS gig here. Really hope I can make a return visit to both schools soon to spread the 'Were-word' that little bit further. Huge thanks to Hannah at Puffin, Annette at QEH and Lucy at BGS for organising the events. And if you want me to visit your school to do a talk - GET IN TOUCH! Speak with your teachers and send them this way. Would be great to come and talk to you. I think Tom fielded the question, unsurprisingly name-checking the opening shots of STAR WARS as the Star Destroyer looms into view whilst chasing the Rebel Cruiser. It's undeniably breathtaking and had a profound effect on both myself and Tom as kids, as well as the other members of the panel - they all agreed that this shot was possibly the 'lightbulb' moment where they fell in love with cinema. Not so for me. I bucked the trend. Much as I loved Star Wars and profound as its influence was on my young mind, it was another film that had fired my imagination, from the comfort of my living room. 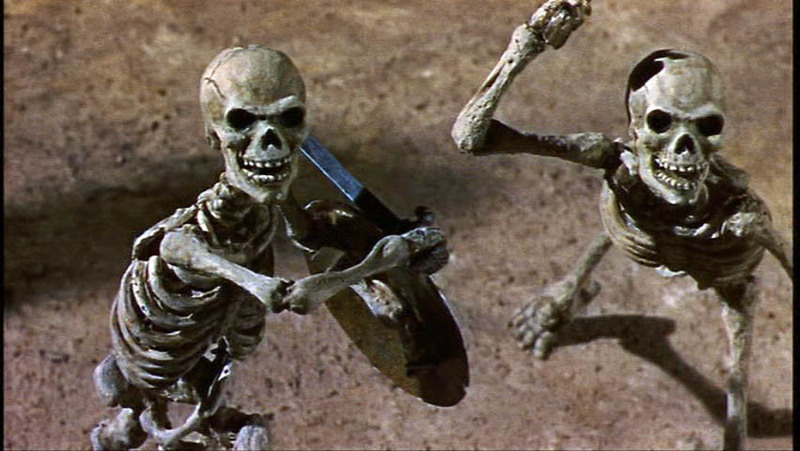 Seeing the statue of Talos groan into life, watching the skeletons rise from the ground, sprouting from the Hydra's teeth - these were what captured my heart as a kid. Yes it's jerky compared to modern day CGI special effects, but as stop motion animation goes this remains sophisticated, stylish and utterly breathtaking. Indeed, this film no doubt inspired every single film maker on the Star Wars franchise, not least George Lucas and Phil Tippett, stop motion animator of many memorable sequences in the series. 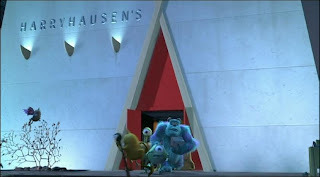 The name of the fancy shmancy restaurant in Monsters Inc is no coincidence. A namecheck to whom? Uncle Ray, of course. And now he's gone, though his influence remains. If I hadn't fallen in love with his films and characters, I'd probably never have spent my childhood playing with Action Men and Star Wars toys at the bottom of the garden, 'dolly-waggling' as my imagination ran riot. This was where I started growing as a storyteller, lost in my own little world, re-enacting the shenanigans Sinbad and Jason got up to. I would never have fallen in love with the Greek Myths if it weren't for Uncle Ray. I'd never have devoured every puppet animation I saw as a kid if it hadn't been for Uncle Ray. I'd never wanted to be an illustrator if it wasn't for Uncle Ray. I probably wouldn't have fallen in love with roleplaying games if it weren't for Uncle Ray, as this was truly where I learned to spin a yarn. I wouldn't have worked on Bob the Builder, or Wallace and Gromit, or Raa Raa if it weren't for Uncle Ray. And I'm pretty sure my first paid gig, Mars Attacks, wouldn't have happened if Uncle Ray hadn't first animated those skeletons. 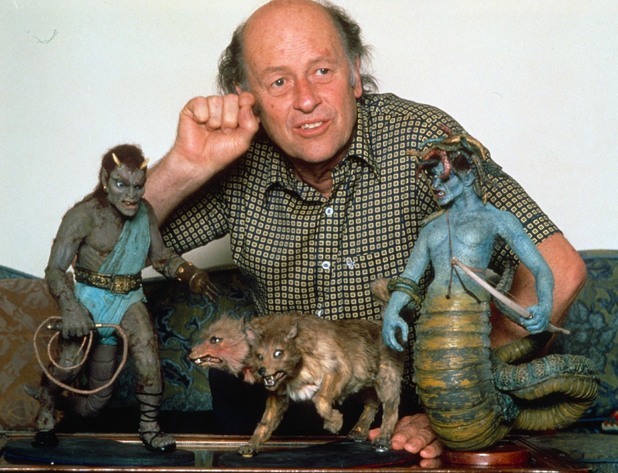 You'll be missed, Mr Harryhausen, but never forgotten. Hot on the heels of the Endangered Authors jaunt across the United States, my next adventure took me to their old sparring partner, Russia. For a good look at how the trip went, check out the splendid wee film produced by Bogdan across on Vimeo. I arrived into Domodedovo which is one of Moscow's airports. 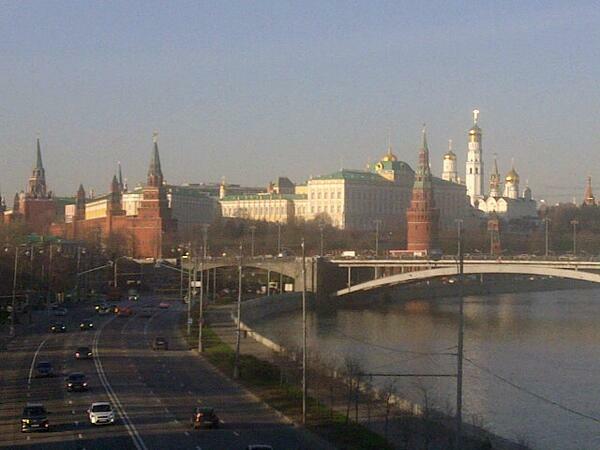 I say it's Moscow's, but it's a whopping hour and a half's drive away on a clear run. I didn't get a clear run on the way i...n - the rain had descended in quite dramatic fashion, making the long road into the city quite a joyless affair. 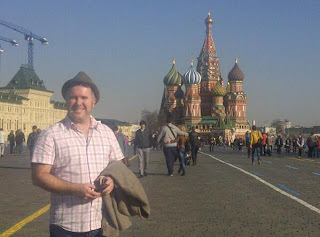 It's fair to say one has a preconceived idea of what Moscow is before one visits, thanks in no small part to what appears in the news and press. First impressions weren't great for me, as I drove past countless high rise blocks for mile upon mile. 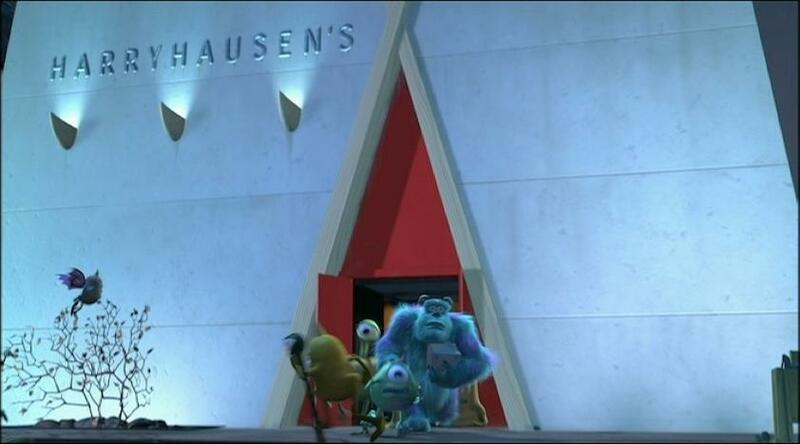 However, upon finally reaching the apartment I would be staying in, my opinion was beginning to change. Librarian of the Middle and High School library at the AAS, John Bishop, was waiting to meet me at the door, showing me in giving me a moment to settle before rustling up some company for the evening. Joined by the very lovely Bogdan Mihai and ace art teacher Ellie, we set off to the Corner Burger restaurant. I know, I know, it's not the authentic Muscovite meal, a BLT Cheeseburger, but I was in need of instant and familiar sustenance at that point in time. We shared a laugh and the guys filled me in on the school before I set off back to my apartment to sleep. An old school bus waited for us in the morning, taking myself and a gang of teachers from the apartment block to the school itself. Security was tight, as one would expect: the school caters for the children of diplomats, business leaders and the like, from over 60 countries in all. Melanie Sobool, Elementary Librarian, and co-conspirator of John's, helped me set up and introduced me to the kids over the following three days. I have to say the kids and staff of the AAC were universally fab, to every man, woman and child. 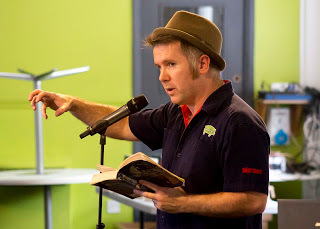 I was made to feel thoroughly welcome and just enough of a rock star to think they might rather dig WEREWORLD once they start reading the books. But this wasn't all about WEREWORLD - I was speaking to kids from pre-Kindergarten upward, not my usual crowd for a distant school visit, but Bob The Builder casts a long shadow over my CV it would appear. Concentrating on picture books and preschool television, I then moved onto Frankenstein's Cat for the 2nd and 3rd Graders before moving onto WEREWORLD with the 4th and 5th Grades. Suffice to say it'd be great to return and talk not only to the Middle school but also the High school - there's plenty in my colourful career that should appeal to any young person setting out into a creative future. Subsequent evenings didn't disappoint, and I've really got to thank John, Bogdan, Melanie, Ian Forster and the rest of the staff for chaperoning me throughout my visit. 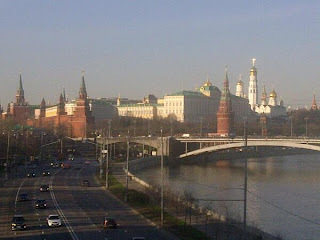 Monday evening we walked down to Red Square to cop an eyeful of the Kremlin. That's an awful lot of bricks. And mortar. And gold. Lots of gold. Tuesday evening involved a trip to the Stanisavsky and Danchenko theatre to watch the ballet - my first time for a bit of tight-festooned dance action and it didn't disappoint. Quite incredible and breathtaking. The only disappointment was the crooked old woman who pushed me aside in her eagerness to get into the theatre beforehand, resulting in a torn pair of jeans. I'm back home in Blighty now, the tour complete and a mountain of dirty laundry all I have to show for it. If you want to find out more about the tour, your best port of call is the official Wereworld Facebook page. 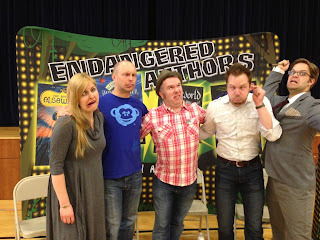 The tour featured four authors - myself, Geoff Rodkey, Jacqueline West and Adam Gidwitz - with Peter McNerney from the Story Pirates the maniac behind the microphone. But this is just a teaser of how things went, the transcript of the final days of the tour and a few choice snaps from the trip. How were those final two days? Let me tell you. We were in Connecticut for the penultimate day, our first port of call Meadowside School in Milford where librarian Gail Sostilio and a tremendously excited gang of kids (and teachers) awaited.... Molly Sardella from Penguin had joined the gang - alongside Elyse Marshall the whole tour has been down to their perfect pitch, planning and handiwork. In the afternoon we headed down the road to Abraham Pierson School in Clinton, where librarian Emily Kelsey greeted us with grinning kids and rather fabulous homemade brownies. Thanks to Karen from RJ Julia bookstore for championing both of these events. Then we were on our way, Jacqui and I the first to depart to Newark for our respective flights home. It was strange and sad to say goodbye to the gang after we'd formed such a tight unit/troupe over the previous three weeks. We'd all got used to one another's oddities: Geoff's need to eat six square meals a day; Peter's inability to imbibe more than one beaker of alcofrolic drink; Jacqueline's moist eyes whenever a waggy-tailed, furry-rumped, four-legged friend trots by; and Adam's penchant for locking his travelling companions in the back of each car we travelled in. Yep, sad indeed to say goodbye to them all as I feel I've made friends for life. I've got to say a BIG thank you to Elyse Marshall and Molly Sardella at Penguin who put the tour together. It's been quite an incredible achievement - thank you so much my dears for inviting this wee fella along with such fabulous authorly company. THANK YOU to all the schools and especially their librarians who have got behind the tour. This has only confirmed to me my suspicion that the job of librarian is truly a calling and one of the most worthy within any school. CHEERS to all the students who attended the show - I hope you've fallen in love with all four of the authors who fought for their lives under Holden A Grudge's wicked questioning. Remember - KEEP YOUR HOBBIES! Who knows where they might lead? LOVE and STUFF to all the wonderful booksellers and stores who have liaised between Penguin and the schools and ensured that every child (and adult) had a chance to snaffle a book or four as a memento of the tour. But most of all THANKS to my fab four travelling companions. Couldn't have imagined doing this with anybody else. The sadness of our parting is outweighed by my reunion with the Jobling wolfpack back home, though. Coming next is my report from my trip over to Moscow to speak at the Anglo American International School. It was a hoot and an eye opener. Don't expect my body clock to be in working order again until sometime in May.